Romania: a country full of contrast! When I have to describe Romania to friends and acquaintances, the first way that I would say about this fascinating, beautiful country is that it is a country of contrasts. From arriving at the buzzing airport onwards, the sights, sounds and smells are so utterly contrasting that you cannot help but be in awe –for outside the airport there are posh and expensive 4x4s and BMWs, but then you also see clapped out Dacias that beg the question if they will make the long ride home. As you drive towards Brasov you see old Pepsi signs in shop windows and bars, advertising it proudly as if it were a new product. You see little old ladies sat by the sides of dusty, busy roads with large, juicy melons sat at their feet as they wait for a random driver to stop and purchase one. You see old horses and carts trundling along the streets, with seven or eight people lounging among the potatoes in the back, stopping at traffic lights and waiting next to the large fast sports cars, which will then leave them in a cloud of dust and the echoes of the supercharged engine roaring. You see towering buildings, vast factories and industry all over the place – and then you find yourself on the lush green mountain road, taking sharp and dangerous corners, nonetheless overtaking the chugging train on the line next to the road. You see no civillisation for what seems like forever, and then you pass by farms with large haystacks outside, and shepherds roaming with their goats, or their sheep, and inevitably lots of dogs. When you enter Brasov, the contrast hits you again. Driving through large, modern houses and businesses, you could be in any prosperous country in Western Europe. But then you see the stray dogs milling about all over the place, fighting for their lives on the streets. And then you move to the old town, where the bright colours and the beautiful houses take your breath away – the centre of Brasov is so pretty and rich, but you can never forget the other sign of the coin that you have seen. As you can probably tell, living in Romania was probably one of my favourite things I have ever done. Just thinking back to it makes me want to return straight away and brings a smile to my face. The people there were incredible – I have never met such honest determination and helpfulness. I struggled to learn a bit of Romanian, and this seemed to cause happiness and laughter wherever I went (mainly laughter I think, looking back). Once I got lost and asked a man for directions – these directions were too complicated for my basic knowledge of his language, and he could tell; but instead of getting irritated and leaving me for dead, he walked me a good 15 minutes in the right direction so that I was no longer lost – all the while he was in his slippers because he just been putting out the rubbish when I had confronted him. There are too many other examples of this kind to name. traditional Romanian food and drink, to teach me about their country and their language, and that often made me feel so accepted, despite the fact I could not have a deep conversation with many of them. The country itself offers so much as well – a cultural and historical richness, a stunning landscape and some beautiful architecture. There is never a dull moment in this country – and all this I can say without even making illusion to the amazing volunteering programme that I was on. 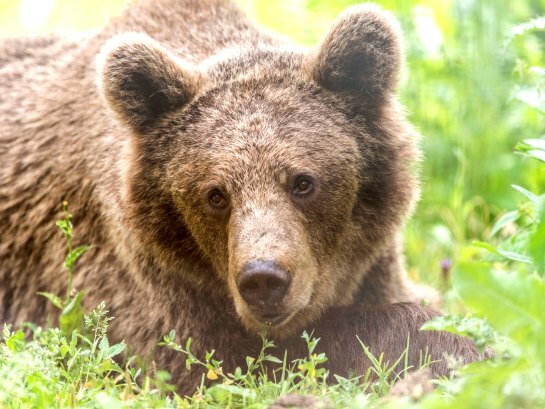 The country, and the bear sanctuary programme, made those three months in Romania possibly three of the happiest months I have ever spent. Anne, thank you for this witty article!